We (at Visual Website Optimizer), in this post, talk about landing page best practices as shared by Oli Gardner, Co-founder of Unbounce.com – the DIY Landing Page Platform. This interview is a part of a series on the blog where the experts in A/B testing, landing pages, conversion rate optimization will share everything they know about how to increase sales and conversions online. Oli Gardner, Co-founder Unbounce, created the conversion blog to discuss a variety of marketing subjects such as landing pages, conversion centered design, social media conversion and ethical lead capture for business. Editor’s Note: While this post is all about landing page best practices, previously on this blog, I had analyzed 50+ landing pages and came up with some practical landing page optimization tips. How important are landing pages for paid marketing? Why can’t a company simply redirect traffic to its homepage? What is the actual purpose of landing pages? Landing pages are critical for any promotion specific marketing – but in particular for paid marketing where a measured ROI is essential to your success (and your ability to gain budgetary approval). The reason why you want to direct your paid traffic to a landing page vs. your homepage is that your homepage is often designed to be a generic entry point to your brand and business. It may contain references to many products or services – rendering the ability for a potential customer to find your intended conversion path amidst 40-70 links unlikely at best – impossible at worst. Which leads nicely into the third part of your question. The purpose of a landing page is to provide a hyper-focused experience that is designed to accomplish the singular conversion goal of your marketing campaign. Usually landing pages look separate from the main website (due to different design, user flow). Do you recommend this distinction between landing pages and main website? I wouldn’t recommend making a stylistic or brand change to the design of your landing page. It’s important to keep it consistent with what your main website represents and what people have experienced in the past (brand memory). The most elemental conversion principle is what’s known as message match. This is a two-way concept that applies to the information scent passing from ad to landing page (your Google AdWords ad talks about green apples, and so does your landing page), but it also applies to the next step in the conversion funnel, which is the visual brand connection from landing page to website. I’ll explain both of these a bit more. If you are doing an eCommerce based “click through” landing page – designed to warm up the prospect’s interest in your offer before passing them onto your website/cart/registration page then you need to maintain “design match” where the visual and tonal brand guidelines are perpetuated on the destination site. If you don’t do this you risk a trust interruption which can cause people to bail. For a lead gen landing page (often called a squeeze page – although I don’t really like the term or the negative segment of the industry typically associated with it) – the experience often ends on the landing page – which means the follow-up experience isn’t quite as critical – but in the case of a big company – there will be a certain amount of brand memory where people expect a connection to their preconceived idea of how you present yourself. Again, without this design/brand match, you can lose people. 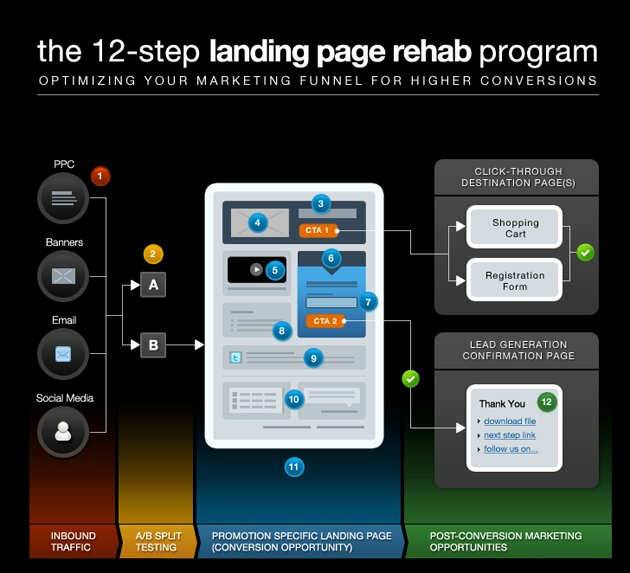 What are the most important characteristics of highly converting landing pages? Focus. Simple and obvious writing. Clean design with an eye for contrast, white space and clarity. A clear call-to-action that describes what will happen when it’s clicked. Stick to those and you’re halfway there. If I had to distil it down to two points, I’d say a headline that you can read in 5 seconds and know what the page and offer is about and a brutally obvious call-to-action (CTA). If you are asked to fix only one thing in a badly performing landing page, what would it be? That’s easy. The thing that was causing it to perform badly! Sadly, it’s not really that simple. The thing to fix will most often be “message match” – this is the part that most people get wrong. You sell someone on a promise with your ad, then when they get to the page, the first thing they read/see represents a different story. So in a generic sense I’d say fix your message match and you’ll fix 80% of your problems. But this is a bit of a trick question. What you need to do is spend some time walking in your customer’s shoes to understand what they are experiencing when they arrive at your page. Long vs. short controversy! How do you prevent making a landing page too sparse that users don’t get motivated or too long so users get distracted? Long vs. short is a classic debate and one that can only be proven through A/B testing so I won’t harp on about any specific hypothesis here. Some higher priced items require more detail – but they also require more research – in which case a landing page may not suffice anyway. It depends on the page goal. If it’s lead gen – then you *must* provide enough incentive to complete the form – whether that’s a big long story or a sufficiently appropriate prize in exchange for the personal data. My favorite page (other than my own of course) tend to come from Webtrends. They just seem to nail it every time. #1 on this compilation and another great example here. Aside from them, Full Sail University does a consistently great job, particularly for lead gen.
Whatever is offered on a landing page (demo, trial, whitepaper, etc. ), do you recommend putting it behind a small lead-gen form or should you give a direct link? Yes and no. I personally think it’s something you need to mix up from time to time. Make it Free. Sometimes it’s great to give away your expertise (particularly an ebook) without any barrier to entry. The goodwill marketing momentum you receive can be worth a lot more than a few leads. If you do this, just make sure you brand your ebook very well (every page should contain your logo and website URL) and a footer that states that you happily encourage the free sharing of your content. Many people don’t know if they should be sharing it without feeling guilty, and a lot of people suffer from guilt issues – so don’t let this prevent you from benefiting from your generosity. Also, there are a lot of old-school marketers out there who are STILL afraid to give content away – thinking it should be copyrighted and protected and locked in a vault. Ask for Data. If you are doing classic lead gen, then you are going to be giving something to your visitors in exchange for their personal information. The key here is to balance the size of the barrier (how much personal data you are asking for) with the size of the prize (what you are offering in return). A/B testing the length of your forms may point to an ideal form size to suit your needs. There are two kinds of barriers with forms – privacy and effort. Awkward or overly personal questions can put people off, or make them enter fake data (which helps no one), while super long forms just serve to make people sigh and hit the back button. If you must ask for a lot of information, make it worthwhile with a really valuable giveaway. Editor’s note: That’s it for the interview! If you know someone whom I can interview or want to contribute a guest post yourself, please shoot me an email at paras@wingify.com. Also, as mentioned at the top of the post, previously I had analyzed 50+ landing pages and came up with some practical landing page optimization tips. So, you may want to check out that post. 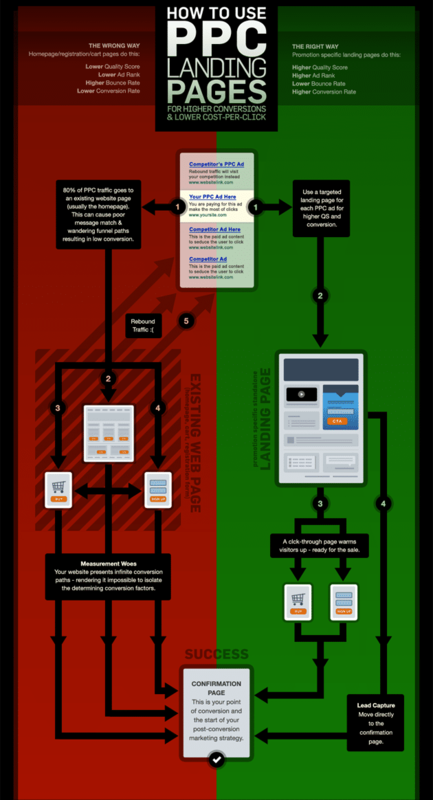 Excellent in-depth overview of landing pages. I absolutely agree with all the points made throughout the article. 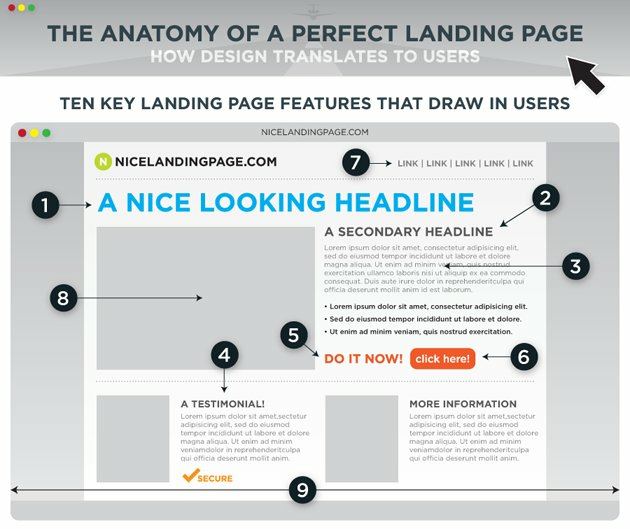 One point I would raise, in the first infographic – It mentioned one landing page per ad. That would be true for Display, but for PPC you’d need one page per, at max, each ad group as you cannot have different landing pages within ad group. @Paul: great point. Yes, you are right. But you can customize the landing page to dynamically include the keyword that was used in PPC search. Very well written piece. Like a good landing page, it is clear, concise and gives valuable and useable content. Thanks for doing the interview and putting this all together Paras! @Paul – yes you are totally right – it’s supposed to say one page per ad group – I’ll need to fix up the infographic. @Paul, In Google AdWords you can have a unique destination URL for each keyword, in addition to the ones for each Text Ad. I find that it is ideal to keep an entire Ad Group going to the same destination, but special circumstances do arise where I am sending specific keywords within an ad group to different landing pages. This mostly happens with Ecommerce campaigns where a descriptive term is sent directly to a product page or sub-category that is a better fit. “Big Widgets” get sent to a “Big Widget” category or specially designed LP. Then I have some lower search volume “Bid Red Widgets” keywords that are pointing to a “Red Widgets” cat/lp. In these cases they are sent to a better destination, but due to “Low Search Volume” filters, like in AdWords, it would be useless to create a unique ad group for them. At least until they start receiving higher consistent monthly searches. Awesome post, it’s the best round-up of landing page best practices I’ve seen. Amped for the next interview. Keep rocking guys, great work. Excellent in-depth post! We are working with clients to help them understand how better to invest their web marketing spend, and in 2011 we really want to emphasize conversion lift testing for clients who’ve done due diligence on more standard search marketing tactics such as SEO. We had an interesting conversation with a web design firm where they couldn’t get clients to understand the importance of SEO, while we had experienced the opposite (being an SEM firm) with clients wanting to focus only on getting TRAFFIC, but were hard to persuade on design elements. To remedy this gap in thinking, we’re trying to emphasize the importance of how these things synergize. Anyway, my point being that this kind of information will help us communicate the importance of design to our clients. @Jennifer: great points. Yes, excessive focus on traffic could be unhealthy. Conversion Rate Optimization is as much important as getting traffic is. Right focus on both is the best approach. I would agree. We’re just getting a blog going on unraveling web marketing investment decisions. Any interest in doing a guest post in the future? Sure, let me know whenever you launch. Awesome Paras! We’ve already launched, but we’re working on design. 😉 Here’s our latest post on choosing a PPC firm. http://www.2disc.com/blog/top-3-things-to-ask-a-potential-ppc-firm/ to give you an idea. Once we update the design, we’ll be ready for a guest post. Focus being on helping clients choose their web marketing spend. Feel free to email me with ideas! Thank for your great article. In your article are much ideas to understand the topic “landing page best practices”. Thanks for helping out. Im working on my kanding pages ( didnt have any at all) and I will use this as a resource. I just want to drop by to say how glad I am reading your post. I’m in the process of learning landing pages and you definitely enlighten me with your great tips. By the way, would you mind if I share this another great blog on squeeze page? Thanks! This is the great relevant information I needed. I feel that you lose potential customers within the first 5 seconds. So like your iconographic explains, its important to get straight to the point right away. Keep it up! The infographics that were provided are ironclad: precisely how a landing page should be designed. Great post! Thanks so much, it was very useful indeed. I recently published a blog post with a list of landing page tools that might help http://www.21stsoft.com/landing-page-tools-to-increase-conversions/. There are plugins, tips and other resources that are all about landing pages and increasing conversions.